If your teeth have been weakened by decay or have been damaged by a dental trauma, an inlay or an onlay can restore them back to health. At Broseley Dental Practice, we will conduct a visual examination of your teeth and take dental x-rays when you visit us. This combined process will help us identify whether one or more of your teeth may need additional support. Inlays and onlays are made from either gold or composite resin. As the composite resin matches the colour of natural teeth, it is barely visible once in place and is a popular option with our patients. 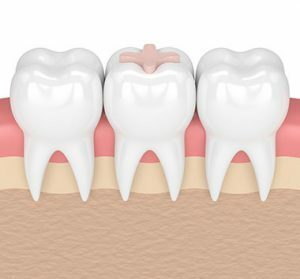 An inlay is placed within the four cusps of a tooth while an onlay overlaps the cusp. We will advise which restoration best suits your dental issue. Your inlay or onlay is custom made for you by our laboratory team. Prior to your dentist adhering it onto the tooth, they will need to prepare your natural tooth. The dentist may remove the damaged section of the tooth or reshape the tooth so that the inlay or onlay fits.